Croissant Bread Pudding with Mexican Chocolate and Almonds | eat. cook. blog. I met local chef/restaurateur Isabel Cruz a few years ago at a Chef Showdown fundraiser benefiting the Center for Community Solutions. 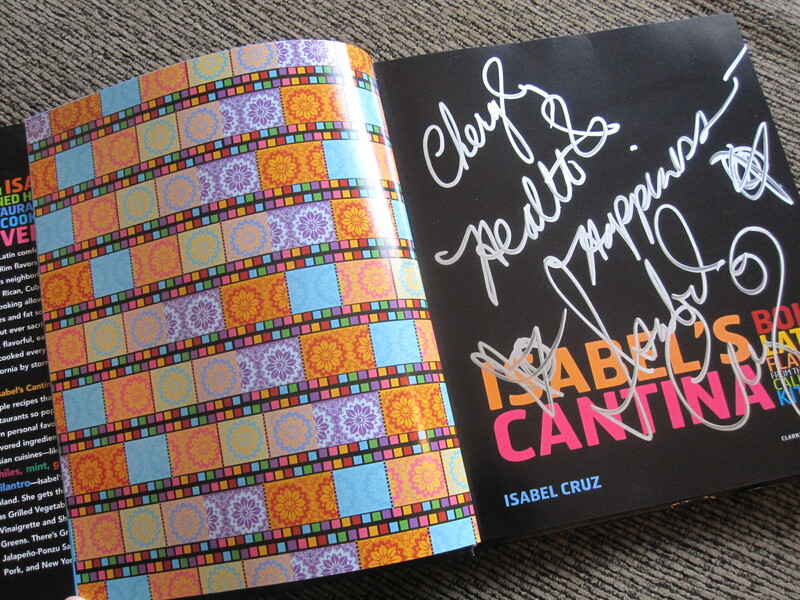 She was selling and signing copies of her newly released cookbook Isabel’s Cantina (from her restaurant of the same name). Even though at the time I hadn’t been to one of her restaurants, she was offering some pretty yummy dishes for sampling, the book was pretty and she seemed nice, so I bought a copy. Besides, as I’ve mentioned before, I’m a sucker for cookbooks and, in particular, chef-signed cookbooks. This recipe is really delicious and really impressive. It looks and tastes a lot more difficult than it is. Really. And every time I make it, people freak out about how good it is, often saying, “this is one of the best things I’ve ever tasted”. And somebody always asks for the recipe. Now you don’t even have to ask!!! I serve it with a little dollop of whipped cream flavored with a little Kahlua. And I promise, it will be one of the best things you’ve ever tasted. Preheat the oven to 350°. Butter a 9″ pie plate and set aside. Combine the eggs, half and half and brown sugar in a large bowl. Whisk to combine. Press the sliced croissants into the egg mixture and soak for about 3 minutes, turning once or twice. They should absorb the egg mixture but not to the point of falling apart. Fit the bottom half of each croissant into the buttered pie plate, sliced side down. 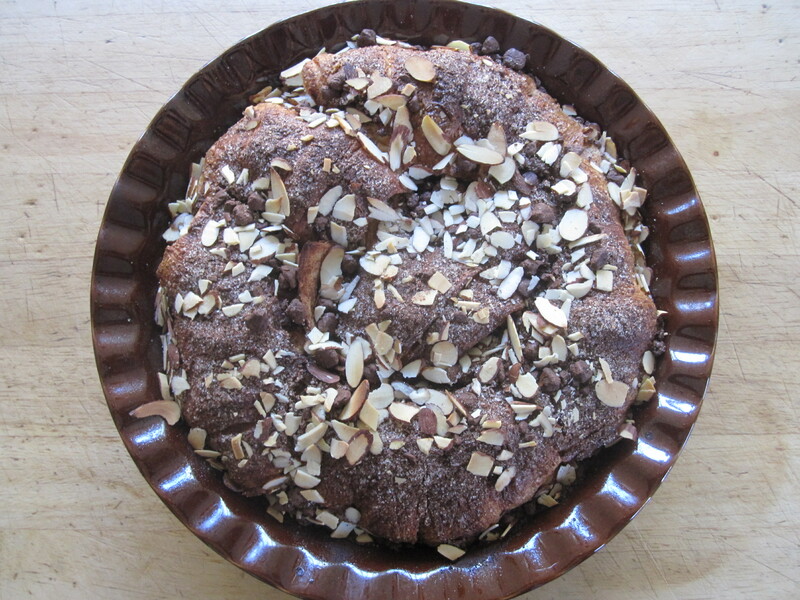 Sprinkle 1 cup of the Mexican chocolate over the croissants and then 1/2 cup of the almonds. Layer the remaining halves of the croissants, sliced side down again, on top. Sprinkle the remaining 1/2 cup chocolate and the remaining almonds over the top. Bake until puffy and dry on top but still moist inside, about 45 minutes. Remove from the oven and let cool slightly before cutting and serving. Serve warm, at room temperature, or chilled. Sprinkle with powdered sugar before serving. Serve with Kahlua whipped cream. The bread pudding can be stored, covered, in the fridge for up to 4 days. Combine the chocolate chips, sugar and cinnamon in a food processor and pulse until finely ground. Store in a cool, dry place in an airtight container.